Historical archaeology, like archaeology in general, must focus on key aspects of research while maintaining meticulous documentation. In order to achieve this, multiple levels of technology are required. 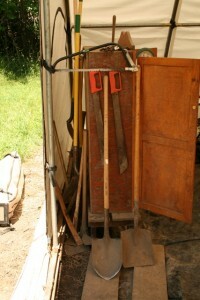 Low-tech resources such as trowels and shovels are as important as more sophisticated tools such as digital cameras and computerized artifact-mapping software. 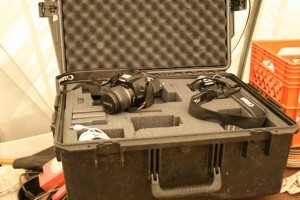 Consequently, different tools and pieces of equipment are required to keep the site up and moving (figure 1). 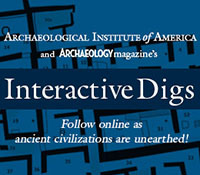 Though digging in the ground may not seem hard, we have to be very careful not to disturb the artifacts or place undue influence on the historical record. As a result, we use everything from simple beams of wood to complex machines that shoot leveling lasers across the grid. 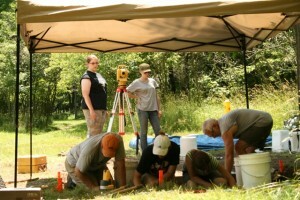 Low-tech resources are central to an archaeologist’s ability to conduct fieldwork. Some examples are trowels, bamboo skewers, small dust pans, plastic buckets, shovels, hedge clippers, improvised scoops made from used milk jugs, simple wooden planks, plumb-bobs, a grinding stone, as well as numerous other tools. The trowel is one of the key tools, being a constant on all archaeological sites around the world. The main advantage of trowels is their small size, which allows for penetration into otherwise awkward areas such as around rocks or under roots blocking access to underlying layers. 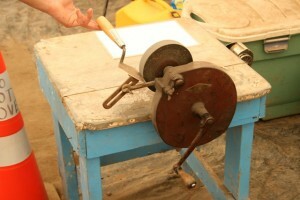 A grinding stone lets us keep our trowels nice and sharp (figure 2). Shovels (figure 3) do get used sometimes on the site, but only for very specific purposes. 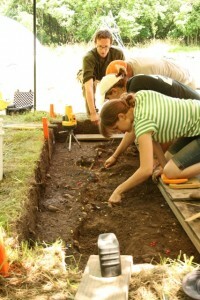 Generally, a shovel will be used to remove sod or topsoil and the corresponding vegetation to clear space for the archaeologists to actually begin excavating. Sod is too difficult to dig through with a trowel but those using shovels must still be careful that they do not disturb the underlying soil more than necessary. The aim is simply to remove any obstructive ground cover without penetrating any cultural layers. 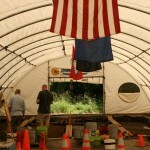 We also use machetes, a saw, and an ax during the beginning stages of excavations. Some of the other simple tools and gear archaeologists use (figure 4) include foam knee pads, meter sticks, and wooden stakes and planks. Knee pads allow us to work for extended periods of time in somewhat uncomfortable positions. Meter sticks are invaluable in maintaining consistent levels as the excavation progresses. Wooden planks allow us to avoid stepping on “clean” units that are already at the previously agreed-upon depth of excavation. Also, wooden stakes allow for the creation of a semi-permanent grid system. Two different types of canopies are used to protect the site from the sun and rain. A weather port is utilized in our larger excavation of a section of the prison hospital (figure 5). A smaller canopy is used to shelter the somewhat fragile excavation of one of the prison latrines (figure 6). 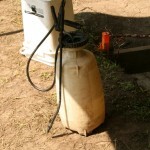 A small water sprayer is used to units to prevent drying out and cracking of the excavated surfaces (figure 7). High-level technologies, while extremely helpful, are not truly necessary. Many tasks that are completed with such technology can be otherwise performed with simpler devices but require more time and effort. 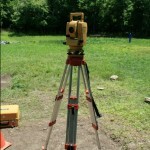 One of these tools is a total station (figure 8), which combines a surveying device called a transit with software used to map the exact coordinated of artifacts and features in the soil. An accompanying tool called a rod allows the station to zero in on exact points on the surface of the site (figure 9). Two different types of electronic levels (figures 10 and 11) are applied to the site in order to sustain proper strata, or layers, within the site. Digital cameras (figure 12) are perhaps the most important type of high-level technology employed at Johnson’s Island. They are used to document important artifacts, specific cultural layers, and to chronicle the excavation process, similar to what we are doing here. Only a few years ago, archaeologists were restricted to film-based cameras, which could take a limited number of exposures and require a long time to develop. Before that, sites were documented using hand-drawn diagrams and maps, which could be woefully inaccurate. 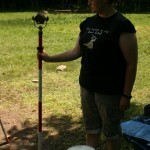 Video cameras add a new dimension that allows for methods to be examined by other archaeologists. As you can clearly see, we use many different tools in our excavations at Johnson’s Island. Aside from a couple devices, all are equally important to the proper excavation and upkeep of the site. Because proper documentation and excavation methods are mandatory to a legitimate archaeological dig, these tools are invaluable to our work. 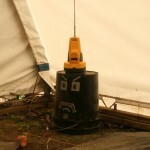 This entry was posted on Friday, June 26, 2009 at 12:59 pm	and is filed under Field Reports. You can follow any responses to this entry through the RSS 2.0 feed. Both comments and pings are currently closed. I enjoyed reading the field reports with the accompanying photos. 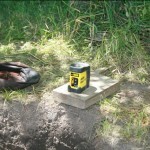 in Field Report 3 you have given a good summary of equipment used at Johnson’s Island. I’m looking forward to volunteering at the site tomorrow, July 3th. I’m eager to see the progress in the hospital units and in the latrine. I’m surprised that you didn’t include the use of geophysical equipment to detect and map the buried features, particularly at a Historic site. This type of technology goes a long way to focussing efforts in the field and normally providing more information than is usually collected at excavation. We are really falling behind in the use of this equipment here in the America’s, which is surprising given our general orientation towards the use of high-tech equipment.